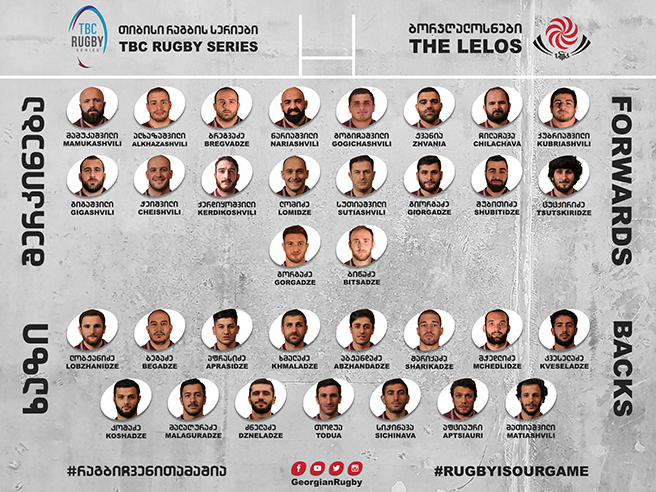 The Lelos are set for TBC Rugby Series 2018 with 34 men squad selected for training camp in France, from where Georgia national team will travel to Florence to face Italy on November 10 at Artemio Franchi stadium. Players from Didi 10 (Georgian top tier Premiership – Big 10), Super Rugby, Top 14 and English Premiership club players will head for France on Saturday, where they will be joined by the other foreign-based Lelos. With two TBC Rugby Series test-matches scheduled at home, The Lelos will travel back to Tbilisi from Florence to play against Samoa on November 17 at Avchala Rugby Stadium and against Tonga on November 24 at Mikheil Meskhi Stadium. All three tests kick off at 18:00 Georgian Time.